Photo: ÖBB / Philipp Horak. 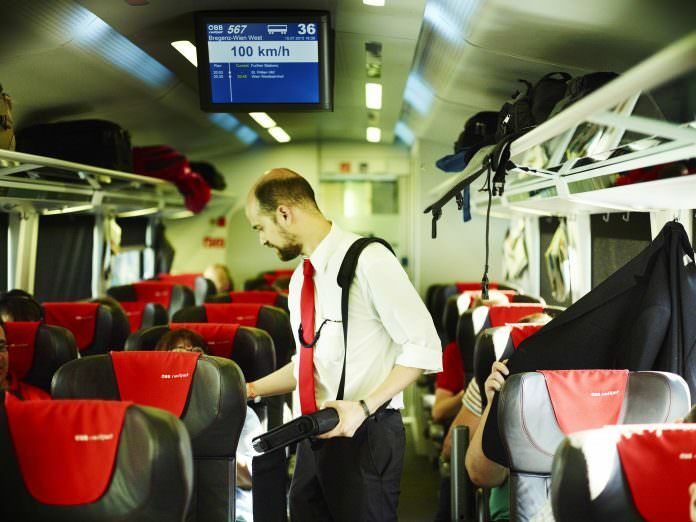 Austria’s national rail operator, ÖBB, is planning to extend the rollout of body cams to its staff following a successful trial at the start of this year. From June, train staff across the network will also wear body cams. It follows trials at stations in Linz, Vienna and Graz earlier in the year. A pilot scheme began in January to trial the use of the cameras, which can be manually switched on by the wearer to capture video evidence of incidents. ÖBB said it has seen fewer reports of threatening behaviour, assaults, property damage and thefts where the cameras have been employed. Staff feedback also showed that employees felt more confident while wearing the cameras, ÖBB has said. As well as the introduction of body cams, ÖBB has been pursuing other additional security measures, such as installing more CCTV cameras, emergency call systems, more security staff and introduced closer working with local police forces. ÖBB chief executive Andreas Matthä said [in German]: “The protection of our employees as well as our customers is of paramount importance.